This is Frank Dasmacci’s Cozy Jet, the only one in the known universe. It’s a Cozy Mk3, that was originally built and certified with a Mazda rotary engine by Greg Richter. After he’d got it in his head to convert it to a jet engine, it went to Robert and Valerie Harris in Tennessee (they’re an authority on canard composite designs). There were a couple of different fuel system and engine mount designs, until they ended up with the current configuration. Unfortunately, Greg had some medical problems, so stopped flying. When Frank went to see the airplane, it hadn’t flown for over a year. Frank and Lisa were waiting to pick up their daughter, and he’d been looking for a turbocharged airplane for flying at altitude. A search on eBay showed the Cozy with 38 seconds left, and after Lisa encouraged him, he bid and won the auction with 2 seconds left. Frank flew to Tennessee several times during the yeaar following the purchase and was involved in the complete rewire and a new panel design and install. Once the jet was ready, Frank flew out there and took around 4 hours getting checked out in the aircraft, then flew it home. It took just over a day to get back, stopping at Laughlin, Nevada, as the jet didn’t have night lights at the time. Another “problem” with the Cozy Jet is that there are so many onlookers whenever you stop for fuel. Frank flew in to Ada, Oklahoma, and a helicopter heard him arrive in the pattern, and wanted to see the airplane. They were followed by the local police and fire trucks, who’d seen him in the pattern and pulled up to take a look. Shortly after, another sheriff arrived and told him that Lockheed Martin were looking for him – he’d cycled the transponder and disappeared from their radar, and they thought he’d crashed. He tested with the radar operator when he was back in the air, and apparently the Cozy Jet (without the spinning propeller) has the target signature of a dove. It’s a General Electric T58-8F engine, known as one of the most reliable turbines ever built. It’s been used in the Sea Knight and Sea King helicopters – Marine One still uses these turbines. The power turbine is removed, and a nozzle has been bolted on to the back. In shaft configuration, it’s 1250 hp, as a jet, it’s 800lbs of thrust. The S duct air inlet has been specially designed to have as straight an input as possible, as swirling can cause a compressor stall. There’s also a fin in the center of the intake, that’s set up to allow some side to side air movement when yawing, but to stop the turbine causing a vortex in the inlet. This also helps cut down the noise. The jet is loud, but meets the requirements for jet noise in the US and Europe. A lot of bystanders think the Cozy is incredibly loud, but a lot of that is that we’re not used to being as close to jet aircraft as we get to the Cozy, and when it’s on the ground, the engine is lower than any other jet you’re likely to see. The Cozy speed brake is enlarged, and there are extra wing root brakes. These have large holes cut in them, to increase the drag they generate. The Cozy is very hard to slow down without them, as it’s such an aerodynamic airframe. Greg Richter was the founder of Blue Mountain Avionics. He developed synthetic vision systems, and the Cozy was installed with 2 EFIS displays. Frank’s replaced those, and replaced the electronic relays with good, old fashioned pop type relays. A lot of the wiring was using computer printer cables, and those have been replaced also. Frank has changed the nose cone to house LED wig/wag landing lights, and plumbed in a 60cf oxygen tank. It’ll take face masks, but Frank flies with cannulas. Empty weight is around 1100lbs, and max gross is just under 2000lbs. The jet engine only weighs 286lbs installed, so the tail has been extended to balance it. The Cozy Mk3 is usually a 3 seater, but this one has had the rear seat removed and replaced with a 60 gallon fuel tank. That acts as a header tank, with the regular main tanks feeding in to it without any need for fuel management. The speed is limited by the airframe, rather than the engine. Frank’s tested it to 240kts indicated air speed. At max gross, its touchdown speed is around 110kts, with a landing roll of around 2600’ – 3000’. Frank tends to cross the threshold about 10kts faster, as there’s a 4.5 second delay between applying throttle and the turbine spinning up. Extra speed is good. 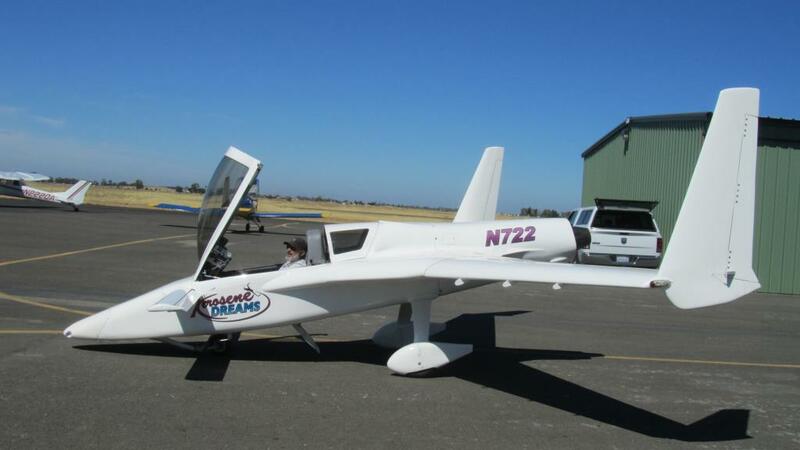 The center of gravity is around the front of the main wing, so there is a minimum load requirement to be correctly balanced – Frank flies with 90lbs of ballast solo. Canards are very sensitive to the center of gravity, as an aft center of gravity will cause the stall speed to increase allowing the main wing to stall before the nose drops. Except for the Velocity, canards park with the noses collapsed, as without the pilot in it, the center of gravity is too far back – a small gust of wind can lift the nose and cause drama. They also have interesting stall behavior, as the canard stalls before the main wing, so the nose’ll drop by itself. 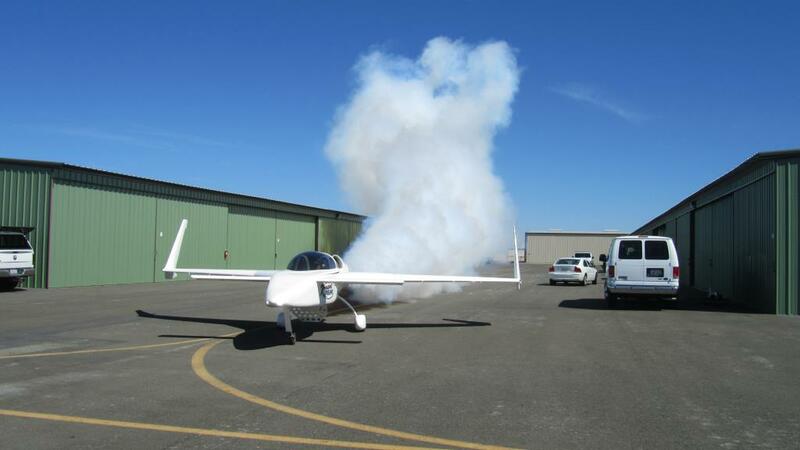 It takes a lot of provocation to get it to stall (the Cozy Jet, with its 20 to 1 glide ratio will generally mush along, at 650’ – 800’ per minute sink rate rather than break away properly), but you’ll end up with a pitch buck, where the nose drops, picks up, drops and so on. The frequency is defined by the weight and center of gravity, but it’s usually about once every half a second. A main wing stall will cause a flat spin, and it’s considered unrecoverable. Frank has around 110 hours (currently) in the Cozy Jet, but is talking about selling it to get in to another project. We look forward to seeing it!